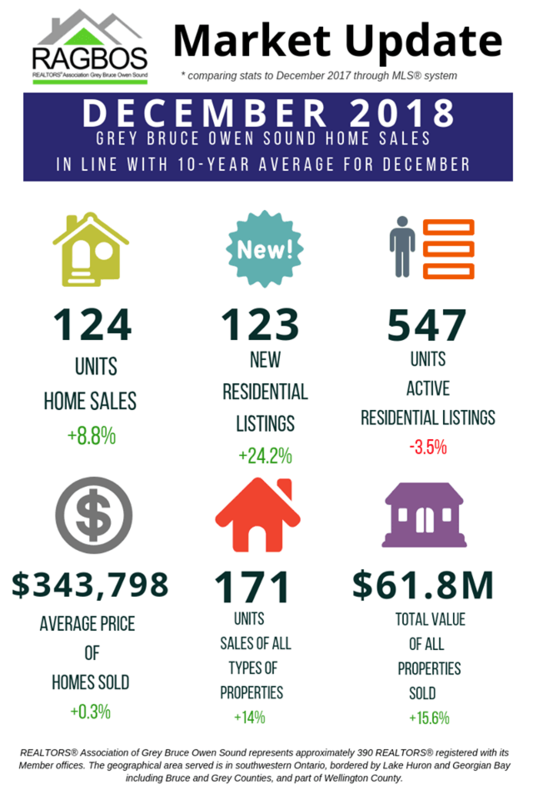 Residential sales activity in the geographical area covered by the REALTORS® Association of Grey Bruce Owen Sound totaled 124 units in December 2018. This was up 8.8% (10 sales) from December 2017 and was right in line with the 10-year December average. On an annual basis, home sales totalled 2,816 units, a decrease of 15.6% from a strong 2017. That said, above 2,500 sales is still a solid year for the local housing market. The average price of homes sold in December 2018 was $343,798, edging up 0.3% from December 2017. The more comprehensive annual average price was a record $358,239, rising 14.8% from 2017. 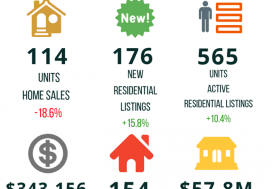 New residential listings in the region numbered 123 units in December 2018. While this was an increase of 24.2% on a year-over-year basis, it was still below average for December. Overall supply remains at record lows. 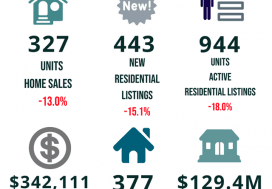 Active residential listings numbered 547 units at the end of December, down 3.5% from the end of December 2017. 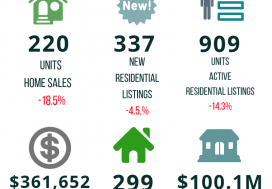 A more average end-of-year inventory would be about 1,200 listings. Months of inventory numbered 4.4 at the end of December 2018, down from the 5.0 months recorded at the end of December 2017 and a record low for the end of the year. The number of months of inventory is the number of months it would take to sell current inventories at the current rate of sales activity. The dollar value of all home sales in December 2018 was $42.6 million, rising 9.1% from the same month in 2017. Sales of all property types numbered 171 units in December 2018, an increase of 14% from December 2017. The total value of all properties sold was $61.8 million, rising 15.6% from December 2017.